The content of this web site is provided for informational purposes only. Life4Animals periodically adds changes or updates the information and documents on this web site without notice. Life4Animals assumes no liability or responsibility for any errors or omissions, nor is any warranty, either express or implied, provided. Life4Animals assumes no responsibility, and shall not be liable for any damages to, or viruses that may infect computer equipment or other property on account of use of this Internet web site. 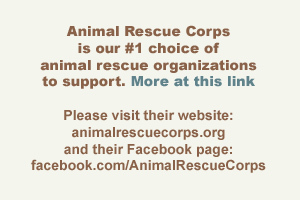 Links to third party web sites are provided only for informational purposes, and do not imply endorsement by Life4Animals, or any affiliation with or endorsement by the owner of the linked web site.Life4Animals is not responsible for the content of any linked site or any consequences of making the link. Copying and use of the content of any linked site is subject to the control of the owner of that site. Except where otherwise noted, all material available on this Internet web site is copyrighted by Life4Animals. Life4Animals reserves all rights. No part of the materials on this Internet web site, including but not limited to the text, graphics and html code, may be reproduced or transmitted in any form by any means without the Provider's written permission. All material is provided for browsing and viewing purposes only. Copyright infringement is a violation of federal law subject to criminal and civil penalties. For any additional questions or comments, please email us. All quotations remain the intellectual property of their respective originators. We do not assert any claim of copyright for individual quotations. By quoting authors we do not in any way mean to imply their endorsement or approval of our site or its contents. "Best Thrift Shop EVER and I go to all of them! More like a boutique! Clean, well organized, fun!"